Per his initial military service record (4616), William Charles Walker was born at Norfolk, England. He gave his age as 22 years and 10 months, his marital status as single, and his occupation as labourer. His description on his medical was height 5 feet 6 ½ inches tall, weight 10 stone 4 lbs, with a medium fair complexion, brown eyes, and dark brown hair. His religious denomination was Church of England. He had a tattoo mark of clasped hands and English and American flags on his right forearm. He completed his medical at Molong on 22nd October 1915, and was attested by Captain Nicholas at Molong (8 miles east) on 22nd October 1915. He claimed to have no previous military experience. It was reported in The Western Champion that the Parkes Recruiting Association had held a recruiting meeting ‘for the purpose of enrolling recruits who were willing to join the volunteers now on the way, by road, from Gilgandra to Sydney’, and that ‘five men had mounted the lorry in response to the appeal’, and that ‘one of them went on to Dubbo’, with the remaining four planning to proceed to Molong to join the contingent. William Charles Walker was one of the four recruits sent by the Parkes Recruiting Association to join the Coo-ees at Molong. On his embarkation roll his address at time of enrolment was Wayvilla, Melford Street, Hurlstone Park, Sydney, N,S,W., and his next of kin is listed as his father, M. Walker, 6th St. Clement Street, Barnsbury, London, England. On 16th February 1916 Private Walker was one of the first group of Coo-ees to embark overseas, and departed Sydney on the HMAT Ballarat A70 as 14th reinforcement for the 13th Battalion. 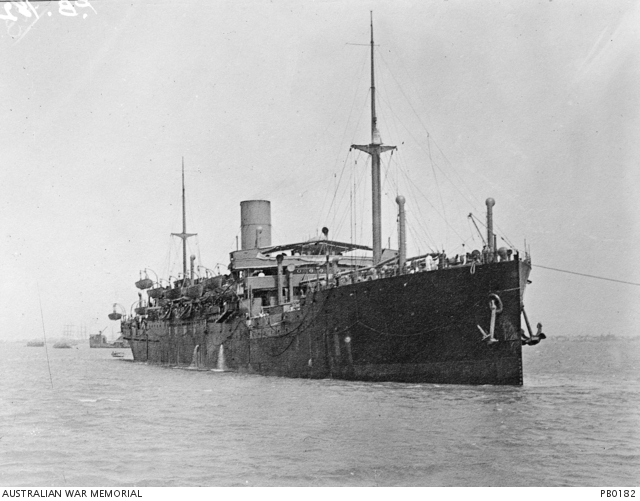 The HMAT Ballarat A70 arrived in Egypt on 22nd March 1916. On 1st April 1916 Private Walker was transferred to the 54th Battalion. On 19th June 1916 Private Walker left Alexandria aboard H.T. Caledonian bound for France, and arrived at Marseilles on 29th June 1916. Just three weeks later, on 19th/20th July 1916 Private Walker was wounded in action during the Battle of Fromelles, receiving a gunshot wound to his right arm. On 22nd July 1916 he was placed aboard the Hospital Ship Cambria at Boulogne, bound for England. On 23rd July 1916 he was admitted to the Southwark Military Hospital at East Dulwich, England. He was discharged from hospital on 18th September 1916 and marched into the 14th Training Battalion. His service record holds a certified extract of a marriage certificate for William Charles Walker and Jessie Elizabeth Browning at the Parish of St. James Church, Islington, dated 16th December 1916. On 22nd February 1917 Private Walker was charged with being absent without leave from Tattoo on 2nd February 1917 till 0850 on 18th February 1917. He was awarded 17 days detention and fined 31 days pay. On 16th March 1917 Private Walker was admitted to the Wareham Isolation Hospital suffering from Mumps. He was discharged and sent to the Number 4 Command Depot on 4th April 1917. On 28th April 1917 Private Walker was charged with being absent without leave from Tattoo from 18th April 1917 until 22rd April 1917. He was awarded 6 days Field Punishment Number 2 and fined 16 days pay. On 10th May 1917 Private Walker was transferred to the 61st Battalion. On 6th July 1917 Private Walker went before a District Court Martial at Hurdcott charged with being absent without leave from Tattoo from 12th May 1917 till apprehended by the Military Police at 2030 on 12th June 1917. He pleaded guilty and was sentenced to 60 days detention and fined 115 days pay. He was sent to the Wadsworth detention barracks to undergo his sentence. He was released from Wadsworth Detention Barracks on 27th August 1917 and marched into the 61st Battalion. On 13th September 1917 Private Walker departed Southampton bound for France, to reinforce the 54th Battalion. He marched into his unit in the 54th Battalion in France on 2nd October 1917. On 30th January 1918 Private Walker was charged with being absent without leave from 9 pm on 21st November 1917 till apprehended by the Military Police at 11 am on 11th December 1917. He was awarded 24 days Field Punishment Number 2 and fined 45 days pay. A letter in his service record from his mother dated 15th October 1919 advised that his father, Matthew Walker, was killed in an air raid in London on 28th January 1918. On 5th February 1918 Private Walker proceeded to the UK on leave. On 20th February 1918 he was granted an extension of leave from 20th to 27th February 1918. On 4th April 1918 Private Walker went before a District Court Martial held at 58 Warwick Square, London, charged with being absent without leave in that he failed to report to the RTO at Victoria Station at 7.30am on 27th February 1918 until he surrendered himself to the civil police on 24th March 1918. He was fined 37 days pay. On 23rd April 1918 Private Walker went before another District Court Martial held at Warwick Square charged with deserting His Majesty’s Service on 7th April 1918 by failing to proceed overseas to join his unit in France as it was his duty to do and remained absent without leave till apprehended by the Civil Police in London on 15th April 1918. He pleaded not guilty and was found guilty. He was sentenced to 6 months detention and fined 199 days pay. On 24th April 1918 Private Walker marched into the Lewes Detention barracks to undergo his sentence. On 15th August 1918 he was discharged from detention with the remainder of his sentence suspended, to march into Number 1 Command Depot at Sutton Veny, England. His service record shows that he was reported absent without leave again a week later. On 12th November 1918 Private Walker went before a District Court Martial charged with being absent without leave from 2359 on 22nd August 1918 till 0730 on 3rd October 1918 (when he returned), then being absent without leave from 0900 on 12th October 1918 till 0930 on 2nd November 1918. He pleaded guilty and was sentenced to 120 days detention. On 27th November 1918 Private Walker marched into the Lewes Detention barracks to undergo his sentence. On 13th February 1919 he was released from detention with the remainder of his sentence suspended, to the 54th Battalion. On 6th March 1919 Private Walker was charged with being absent without leave from 1400 on 17th February 1919 till 1700 on 28th February 1919. The matter was dismissed. On 15th March 1919 Private Walker was charged with being absent without leave from 0900 on 11th March 1919 till 1200 on 14th March 1919. He was awarded 5 days Field Punishment Number 2 and fined 9 days pay. On 19th April 1919 Private Walker was charged with being absent without leave from 13th April 1919 to 17th April 1919. The case was dismissed. On 17th July 1919 Private Walker was admitted to the 1st Australian Auxiliary Hospital at Harefield, England. He was discharged on 21st July 1919. On 24th August 1919 Private Walker was “granted indefinite leave awaiting, awaiting a family ship”. Private Walker applied for discharge in the U.K., his reason stated in his Application for a Discharge in a Country other than Australia, dated 8th September 1919, as: “My wife now being pregnant I think it wise for me to stay in England. My mother also getting on in years and her being a widow, I think it my duty to try and comfort her, but if returned to Australia, it would cause inconvenience on both sides. I can obtain employment, my relations are holding business in London. I must note the fact that my father was killed in an Air Raid over London on 28.1.18”. This application was approved, and he was discharged in London on 18th December 1919.